INDIANAPOLIS (July 21, 2014) — Klipsch, a leading global speaker and headphone manufacturer, today announces the launch of its Reference R-10B soundbar. The same advanced acoustic engineering and industrial design from the brand’s original Reference home theater line inspires the performance, voice and design of the soundbar. The two-way soundbar boasts premium drivers, two lightweight ¾-inch horn-loaded textile dome tweeters for distinctive high-frequency detail, and two 3-inch polypropylene woofers that round out the enhanced sound with crisp vocal and dynamic soundtracks. Its tweeters are coupled with Klipsch-exclusive Tractrix® Horns to reduce distortion and increase dispersion more directly to the main listening area. Included with the soundbar is an 8-inch side-firing wireless subwoofer that is housed in a MDF cabinet with a slot-port design for a deep, powerful bass. The subwoofer pairs automatically with the soundbar given its sophisticated wireless technology. The Reference R-10B soundbar is compatible with most Bluetooth® wireless enabled devices and also offers aptX™ audio coding technology for lossless, high-quality music streaming. Its Dolby® Digital Decoder allows the soundbar to automatically reproduce detailed, high-quality sound no matter what format of sound is coming from the TV’s output. 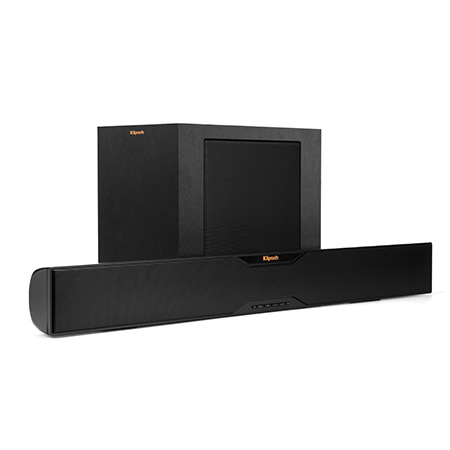 The Klipsch Reference R-10B soundbar retails for $599.99 (US.MSRP) and is now available for purchase at authorized retailers and Klipsch.com.